Hi, I’m Natalie, and I’m now obsessed with doing laundry. Our new house had a washer and dryer hookup, but no washer and dryer. I originally thought we would buy an old, used set off Craigslist. We could keep it simple. But then my dad mentioned how much we would save on our electricity bill in the long run if we bought an energy efficient front loading washer and dryer. Plus, we will most likely be using this set for years and years to come. A little seed was planted. Must. Get. Front. Loading. Washer. And. Dryer. It would be so much prettier in the open hallway where the washer and dryer go that I walk past about 20 times a day. Of course when begging Shawn I only touted the benefits of getting energy efficient. Luckily it didn’t take much convincing after seeing that Home Depot had an LG set on sale 30% off for 4th of July weekend. Off to Home Depot we went, after a day of painting and building Ikea furniture. We we’re a hot mess. Not hot as in attractive, hot as in sweaty. We were a sweaty mess. But so is everyone else at Home Depot at 7pm on Saturday night. We fit right in, paint stains on our shirt and all. I’m looking for any excuse to do laundry. Thank goodness peaches are in season, those juicy peaches are packed full of juice that will surely drip all over my clothes. Hurray for more laundry! Besides featuring my favorite fruit of the summer, this peach and burrata arugula salad features my new favorite cheese: burrata. Oh burrata, how have I never had you until this year? It is like a creamier, velvetier version of fresh mozzarella cheese. The outside is firm like mozarella, but the inside is so soft and spreadable. It’s amazing. You are going to want to make this peach and burrata arugula salad all summer long. The sweet peaches with the creamy burrata mixed with the peppery arugula. It is flavor heaven in your mouth. 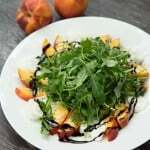 When you make this peach and burrata arugula salad, I am going to have to insist you also make the grilled bread with rosemary dipping oil. The 2 pair perfectly together with a glass of chardonnay, a warm summer night, and Ben Rector playing on Spotify. At least that is how Shawn and I enjoyed this peach and burrata arugula salad the last 2 times I made it, *wink*. On 2 plates, arrange the peaches and burrata along the outer edges, leaving the center open. In a large bowl, make the salad dressing by combining all ingredients and whisking to combine. Add in the arugula, and toss to coat all the arugula. Add the dressed arugula to the center of the plates of peach and burrata. 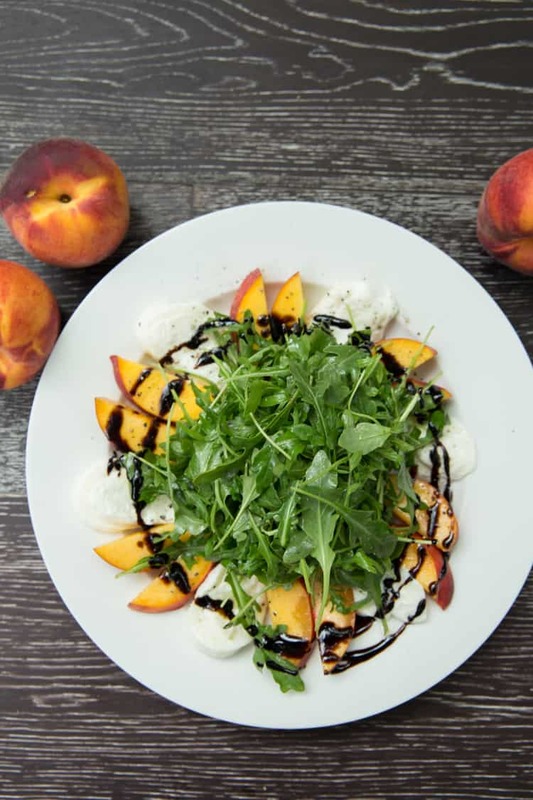 On each plate, drizzle 1 tablespoon olive oil and 1 tablespoon balsamic glaze on the peaches and burrata. 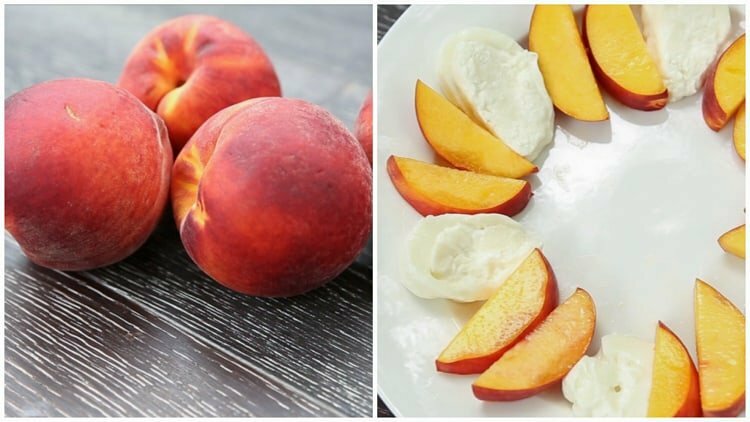 Sprinkle the peaches and burrata with a pinch of salt and pepper. If you can’t find burrata, you could substitute fresh mozzarella cheese. This salad looks amazing, Natalie! What a creative combination to add to arugula. Peach is one of my favorite fruits for the summer, so this looks like the perfect combination. Pinned! Yep. I so want a mountain of this gorgeous salad and a huge pile of your bread on the side. This looks seriously amazing, Natalie! I’ve never tried burrata cheese before, but I am loving the sound of it. I need to get my hands on some so I can make this salad PRONTO. Pinned! We could use some of your can-do attitude over here to deal with our mountain of laundry! ;) This salad looks healthy and fresh! So nice for a summer lunch! We are SUCH twins! Do you just love your new washer and dryer? It’s like the most grown up fun toy EVER! I love that we moved on the exact same weekend, and you can feel my, “this is so exciting! uggghhh, this is so much work!” roller coaster of emotions. We get cable tomorrow, woo hoo! This is total proof it is the little things in life that can bring us the most joy! :) Love the salad recipe, anything with peaches and I am in! Hi Natalie, love this salad, have to get my hands on some burrata, sounds wonderful. Also your video is such a nice touch, keep them coming! I hope your laundry motivation lasts a while! This salad looks perfect. Fresh peaches are the best right now, and I bet they pair perfectly with the peppery arugula and creamy burrata! Natalie you can come over and do the laundry anytime. LOL. I hate doing laundry. Especially the putting it all away part. What I love is burrata, it’s my favorite. Such a perfect combination of flavors on this plate. Love it. I was lucky enough to be a taste tester for this delicious salad and I have already made it at my house!! I absolutely love it. My first time trying bursts cheese and I loved it. I have been really getting in to adding fruit to my salad recently (starting with strawberries and balsamic) and this sounds like the thing I need to move on to next. It looks delicious. God I love Burrata. I was just in Rome last weekend, and let’s just say it was pretty darn amazing. You and Shawn should venture into SF and go to Burrata restaurant! The pizzas are soooo good. I’m happy to hear about your washer dryer :) I don’t have one in our apartment, but the building has 3 of each, so I can get laundry done in one fell swoop which is pretty awesome. There’s a whole restaurant in SF called Burrata?! Ahhh, I’m going right away! I swear to goodness, we are coast-to-coast moving twins! :) Our new home didn’t come with a washer/dryer, either, and we also bought LG models! I absolutely love them (and they sing to us when they’re finished) and definitely seem more efficient than the appliances we left at the condo. So impressed so far. Oh my gosh! We are SUCH twins! Mine sing to me when they’re done too! Makes me so happy. Did you get the ones on sale at Home Depot? Quite the bargain. And so far worth every penny. I’m having waaaay to much fun with them. Haha you are too cute girl :) I don’t mind doing laundry but it’s the folding and putting it away part that I’m not a fan of. But I am a BIG fan of arugula and this salad! It looks fabulous! 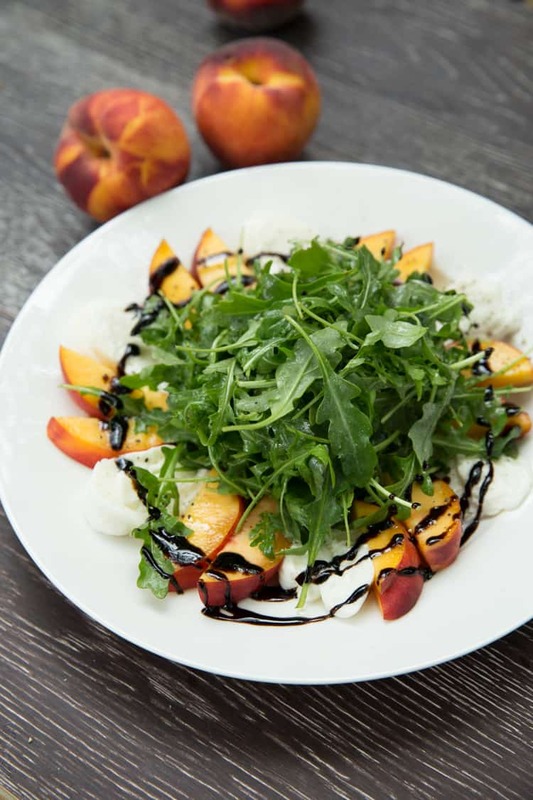 I love the juicy peaches in here and with the burrata and balsamic glaze it sounds all kinds of amazing! This looks so amazingly fresh and simple, love this type of salad on a hot summer day! And I’m pretty sure your washer addiction will wear off pretty soon, I was like that with my vacuum for awhile and now I’m back to hating vacuuming! I love this Natalie!! I have a fridge full of peaches right now so I should definitely make this. plus, burrata. duh. PS I love your video, your hands look amazing! No really. This post made me laugh. They know our names at Lowes and Home Depot and I’m constantly in there with paint stained clothes. I wish I were kidding, but I’m not. Don’t feel so alone! This salad looks delicious, I love everything about it. Pinning right now! This is such a pretty, refreshing salad, Natalie (we’re peach salad twins this week – I made one too, but quite a bit different ;-) I love the way you’ve presented it with the peaches around the edge. This sounds wonderful! It’s on my list to try. 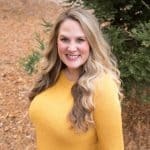 Loving this recipe Natalie!! It screams summer and I’m all over it. Pinning so I remember to make! Girl, let me know if I can bring you my laundry. ;) You are having too much fun in the new house! This salad sounds perfect. I am so not in the mood to fire up the stove lately. And hello anything that goes well with wine gets an A+! Love the video! I am so SO jealous of your washer dryer!!! I would be just like you – washing any and everything! I miss being able to do laundry like a normal person!! This salad looks delicious – so fresh and summery!! And I love the video – so fun!! Oh yeah… I have a secret ‘laundry’ addiction too, teehee, good to hear you are enjoying your new toys. :) Its not really salad weather, but Im adding this beauty to the summer cooking list. Sooo good, gawd I love peaches. Not even getting a brand new washer and dryer can make me look forward to laundry! Hate it. But I so love this salad. Peaches make such a great summer dish. Bet they taste amazing with that salad dressing and cheese! Oh my goodness! Burrata and peaches! Looks totally awesome! I need this salad! Making it next week.